D'ah! He is so cute! I love this game and you did a fabulous job! Awesome! I love it :) This made my day. I was straight up addicted to this game for a long time! These nails are so cute! 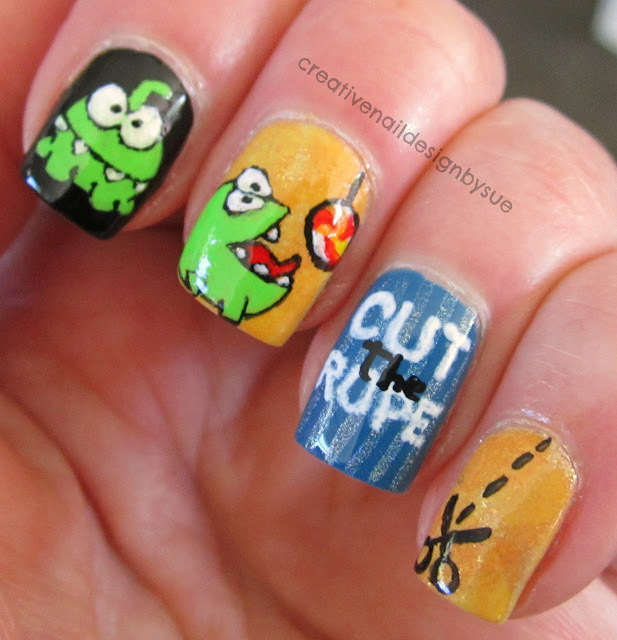 This post has just reminded me how I still have to complete some levels in cut the rope. Let the procrastination begin.. ah!!! i love this! this game haunts my nightmares, it seems so easy but then it gets soooo hard! these nails are perfection! well done lady! These could be stickers they're that perfect! I guess I'm not a geek as I've never heard of this game (bahahahah!) but your mani is awesome! I used to play this all the time! Its so cute!